The 12 Questions series of driver interviews continues with Brad Sweet, the Kasey Kahne Racing sprint car driver who just won the 2018 Knoxville Nationals last weekend. This interview was recorded as a podcast but is also transcribed below for those who prefer to read. I probably dream about racing a few times a year — but I live, eat and breathe it while I’m awake. So luckily, I don’t have to dream about it too much while I’m sleeping. You do what, 90 races per year? Yeah, we usually have about 95 races on our schedule. And we don’t get to go home all that often because there are a lot of midweek races — Tuesdays, Wednesdays, Fridays, Saturdays, Sundays. So we pretty much live, eat and breathe racing from February to November. 2. If you get into someone during a race — intentional or not — does it matter if you apologize? I realize there would be a lot higher consequences for that in a sprint car race than a NASCAR race. Yeah. Obviously, when we get into each other, a lot bigger crashes happen. Our cars are open-wheel, so usually it’s very unintentional, because if you get into someone, it can hurt you just as bad as you can hurt them. We don’t really have the bump-and-runs because your front tires are exposed and your rear tires are exposed, so if they touch tires, usually you both go crashing. But there are times you make move and wipe someone’s front end out or something. And then it just depends. If they race you like that, a lot of times you might get them back. It’s just the way it is. Then there’s other times where it was a complete accident and you really want them to know it was an accident, because we race against each other so much, you don’t want any grudges happening throughout the season. Is the World of Outlaws community tight-knit like the NASCAR community is with the motorhome lot? Absolutely. Just as tight; there’s certain guys who are probably even tighter, just because we do travel so much. The drivers are literally the motorhome drivers and set up the T-shirt trailers. We all help each other get down the road. And then all the teams work together to get up and down the road. It turns into a family. You see these people out here just as much or more as you see your family members back at home. There’s friendships that are closer than others, but for the most part, everyone gets along really well and you can almost count on a lot of people to help you out throughout the season. That’s tough. I would say the biggest compliment in my life right now would be I’m a good dad and a good husband and a good person. I’m kind of a big The Rock fan — Dwayne Johnson. I got really into him after watching Ballers on HBO. I feel like he’d be super into it. He’s that type of guy who just embraces everything. Plus I’d love to ask him questions. He just seems like he really understands how this world works and knows how to do a great job. He works hard at what he does. I admire him a lot. 5. In an effort to show this is a health-conscious sport, the World of Outlaws decides to offer the pole for an A-Main at an upcoming race to the first driver willing to go vegan for one month. Would you do it? I guess it would depend on the race a little bit. If it was the Knoxville Nationals, probably. Because I’d probably need to lose a little weight before we get there anyway and get in good shape. There are some races I would do it for — our big three races are the Knoxville Nationals, the Kings Royal (at Eldora Speedway) and the National Open (at Williams Grove Speedway). If it was just one of our standard races, probably not. Yeah. We’re in good shape and I didn’t have to go vegan, so I’m pretty happy about that. 6. It’s time for the Random Race Challenge. I’ve picked a random race from your career and you have to tell me where you finished. This is the 2013 Texas fall Xfinity race. Do you happen to remember that one at all? I’m going to say I finished 10th. You finished eighth in this race. Started ninth, led seven laps. Matt Kenseth won. Yeah, I remember getting a top-10. I couldn’t remember where I finished. I had a couple good runs, but not as many as I’d like to. When you look back on your NASCAR career, would you have done anything differently? I’m super happy with where I’m at now, but there were a couple years where I really beat myself up because those opportunities just don’t come around. I had a great opportunity to do good. I wish I would have just gotten to learn a little more in a stock car before getting thrown into Trucks and Xfinity. I did two half-seasons in Xfinity. So basically I felt like the second half of what would have been my first full season, I started to kind of figure it out. I feel like if I could have gone and done one full season, it would have been a completely different story. But looking back on it, now I’m actually just really happy where I’m at and I don’t actually miss it — at all. So I’m in a really happy place in my life and I think a lot of that would have been different if I had been successful in NASCAR. That’s just how life works, I guess. I just wish I would have gotten more training, basically. 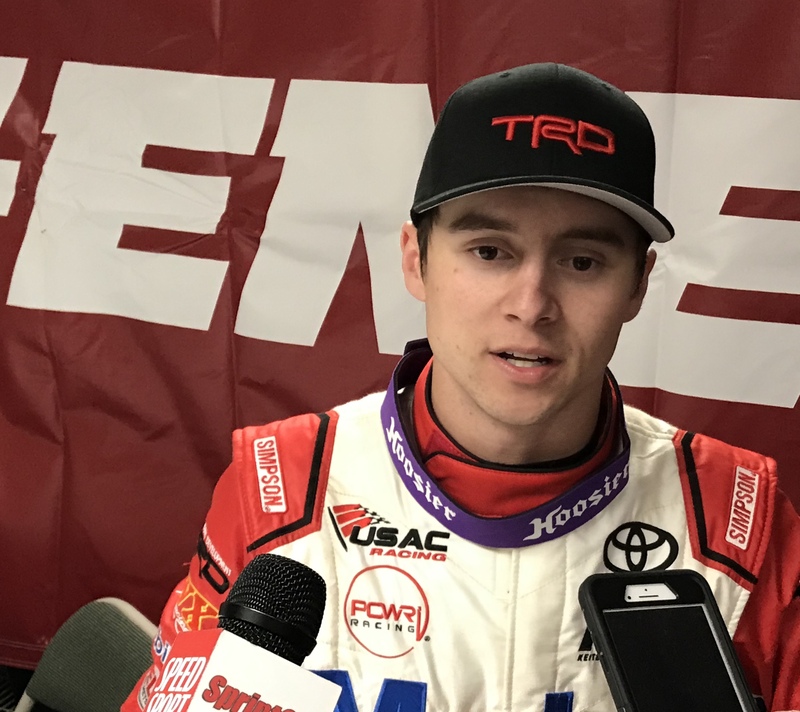 I don’t have that Kyle Larson or maybe Chris Bell natural ability — I’ve always had to work harder at doing it. But I always feel like once I get something and work at it, I can run just as good as anybody. I mean, I like Donny Schatz, but damn he makes me mad sometimes. (Laughs) So Donny Schatz. It seems like a lot of fans boo him because he wins so much — not because they dislike his personality. Is that right? Yeah, he doesn’t have the Kyle Busch personality. He has somewhat of a nice personality. But he wins, you know? And everybody always cheers for the underdogs because they get tired of seeing certain people win. That’s half of why people don’t like Kyle Busch, and it’s the same with Donny Schatz — they just want someone else to win. That’s in any sport. They always don’t like the winning team; we always cheer the underdog. Luckily, I’m kind of considered the underdog over here just because Donny Schatz has won so much. So I actually get a lot of people saying, “Please beat Donny, please beat Donny.” I get that night in and night out. “Anybody but Donny. Please.” We’re always trying, so it gives the fans a little extra to get excited about. Man, that’s tough. I think LeBron James will probably be my crew chief. He seems to think about how things really work. He might not be the most mechanically inclined guy, but if we could explain it to him, I think he could really get it. Taylor Swift, we’ll go ahead and make her the team owner. She seems like she’d be good at that. And then we’ll have Tom Hanks be the bus driver because he’d be fun. He’d be a good guy to make jokes and probably have a couple drinks with. Luckily for us, we have our trucks and trailers a lot with us and we basically pit out of there. We don’t have to go out like in NASCAR onto the grid and do the whole deal. So we have a bathroom right here in our trailer that’s pretty much money in the bank. But actually this week here at Knoxville, we don’t have the bathroom (because the trailers are parked outside the track). So I don’t know. I have a hard time with public restrooms, but when you gotta go, you gotta go. Here you just go to the closest one, because there’s really no special one. When I was in NASCAR, I remember there were always some special hidden gems along the way. I know you don’t want to get any bad ones. 11. The World of Outlaws noticed the highlight reel value brought by Carl Edwards’ backflips when he was in NASCAR and wants a sprint car version. How much money would they have to offer for you to backflip off your car following your next win? (Laughs) If I could do a backflip, I would probably do it for free because that’s cool. But they’d just have to pay for the training, and there’d be a lot of training because I don’t think I’m anywhere close to being able to do a backflip. It would be hard to do it off the wing, too. You’d almost have to do a double backflip because you’d be so high in the air. It’d be a lot more dangerous. Maybe off the front tire. You could maybe stand up there and do a backflip. That’d maybe be a little lower than where Carl did it off the door, but not that much lower. But you’d have to pay me a lot, because I feel like I’d hurt myself in a hurry for sure. 12. Each week, I ask a driver to give me a question for the next interview. Last week was Garrett Smithley from the Xfinity Series. His question is: What was the first time you ever got into a 410 sprint car, what was that feeling like and how long did it take you to get up to speed? That’s a good question. The first time I got in a 410 sprint car was 2005. (Editor’s note: World of Outlaws sprint cars have 410 cubic inch engines and are referred to as “410s.” Other series run 360ci engines and are called 360s.) I’d driven 360 sprint cars, so that was a good transition from go-karts. I remember the first time I got in a 410, I could not control it. I couldn’t believe the amount of power it had. It’s definitely taken years to be able to figure out how to control that type of power. It’s an unbelievable amount of horsepower for how light the race cars are. I remember just being blown away. And still to this day, it blows me away how fast and how much power we really have. Do you have a question I can ask someone back in the NASCAR garage? If they’ve never driven a dirt car, what dirt car would they choose to drive and what racetrack? So like in terms of a sprint car or a modified or something like that? Yeah, just see what their interest is. If they only grew up on pavement, do they have interest in driving on dirt? To some NASCAR guys, it seems like sprint cars are kind of voodoo — like, “Man, those are just dangerous.” So is it a dirt Late Model maybe? Or do they want to try it? I’d just like to see what their interest in dirt racing is. This is the first 12 Questions interview with Brad Sweet. Brad Sweet found himself feeling tense and nervous all day heading into the Knoxville Nationals, the race he’s worked his entire life to win. Sweet had the fastest car in Iowa all week and was starting from the pole position for sprint car racing’s Super Bowl. But that did nothing to alleviate the nerves. Thoughts swirled through his head about his game plan — stick to the bottom — and the notes he’d been taking since the very first race of the season at Volusia. What can I learn in this race that can apply to Knoxville? But then, before the racing started, everyone in the pits stopped what they were doing. A video paying tribute to the late Jason Johnson, who was killed in a June sprint car race, appeared on the track’s big screen. The tribute footage included moments from Johnson’s own Knoxville Nationals win, and suddenly everything changed for Sweet. Ultimately, that’s what Sweet had to do to win his first career Nationals and etch his name among the greats who have won the legendary race. The Kasey Kahne Racing driver’s lead over 10-time Nationals winner Donny Schatz was erased by a red flag with two laps to go, and Sweet sat in his car knowing he’d have to hold off the world’s two best sprint car racers — Schatz and Kyle Larson (Sweet’s soon-to-be brother-in-law) to win. Two more laps. Just two more laps. Sweet decided to run the bottom, as he’d done all weekend, leaving Schatz a chance to win from the top. “I ran the bottom 75 straight laps this whole week, so what was two more?” Sweet told himself. One mile later, Sweet was screaming with joy while standing on top of his wing in victory lane. He’d done it. 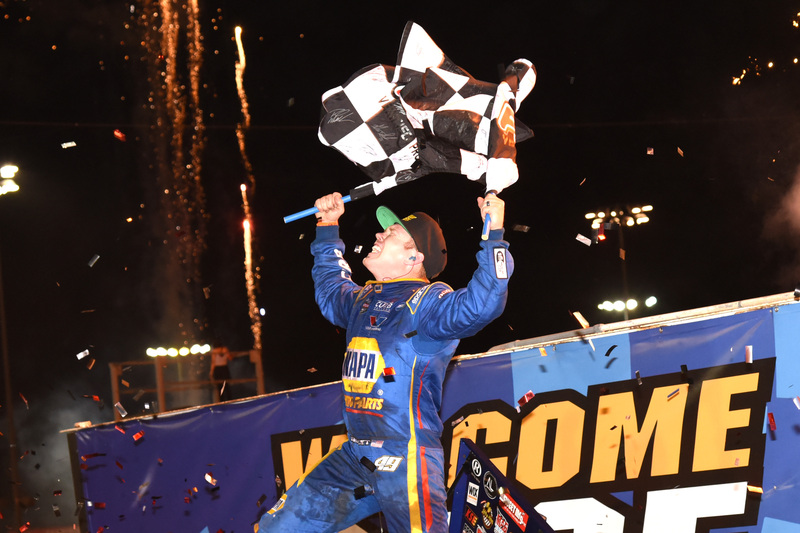 The Californian was the 2018 Knoxville Nationals champion. The side-by-side finish at the line over Schatz was recorded at a margin of 0.133 second, which was the second-closest in Nationals history. Schatz said he was hoping for one more lap, but ran out of time. Larson, meanwhile, will have to wait another year to try and win his first Nationals. But Sweet, the brother of Larson’s fiancee Katelyn, had at least one member of the Larson family who was quite pleased with the outcome. An hour before the final night began, Larson held 3-year-old son Owen in his arms and asked an innocent question: Which driver did Owen want to win the Nationals: Owen’s dad or Owen’s uncle? “I want Uncle Brad to win!” Owen said. Owen, as it turned out, got his wish.